Appropriately named, TrustBox, this Scalys TrustBox is a secure router and IoT gateway for safe and trusted communication with the connected world. It secures the communication and connectivity of connected devices up to a military grade of security. Combining high throughput with hardware hardened security features into one device, the TrustBox provides a secure internet connection experience whether it is used on-the-go or at home. The TrustBox is based around the NXP® Layerscape® LS1012A networking processor with integrated networking acceleration. By combining this SoC with secure hardware architecture and the ability to block cyber-attacks, TrustBox manufacturer Scalys has "achieved a level of security that greatly surpasses that of devices primarily relying on software-based security." Designed using in-depth knowledge of military grade electronic devices and incorporating comprehensive IoT gateway, VPN and router solutions, the TrustBox is ideal for consumer, networking and industrial IoT applications alike. Following the rich set of security embedded in the TrustBox, the product is also certifiable to the highest level of industry security standards. In designing and developing the TrustBox, Scalys has partnered up with industry leaders NXP and Microsoft. Hans Klos, CEO at Scalys, said that Scalys has developed the TrustBox because they see cyber security as a key emerging risk and believe that high-grade secure communication solutions are necessary nowadays. Together with their strong partners Microsoft and NXP, they have succeeded in building this cyber secure communication platform. Sam Fuller, Director of Marketing at NXP, added that the engineers at Scalys have put the Trust Architecture security features of the NXP Layerscape LS1012A networking processor to excellent use in the TrustBox. Integrating a hardware root of trust and cryptographic accelerators, NXP's Layerscape family helps enable companies such as Scalys implement secure routers and IoT devices. Sam George, Director of Azure IoT Engineering at Microsoft, stated that securing IoT is complex and needs to be addressed at every layer. They are focused on addressing IoT security of the whole solution — from chip, to software and the cloud. TrustBox's highly secure hardware, along with the Open Enclave SDK provided by Microsoft, complements the secure software in Microsoft Azure IoT Edge and connects safely to Microsoft Azure IoT Hub and other Azure cloud services. On November 8th the TrustBox has been named a CES® 2019 Best of Innovation Awards Honoree. The announcement was made during CES Unveiled New York, an invite-only tech event bringing together top media, exhibitors and industry leaders for a sneak peek of the products and trends expected at CES 2019, which will run January 8-11, 2019 in Las Vegas, NV. 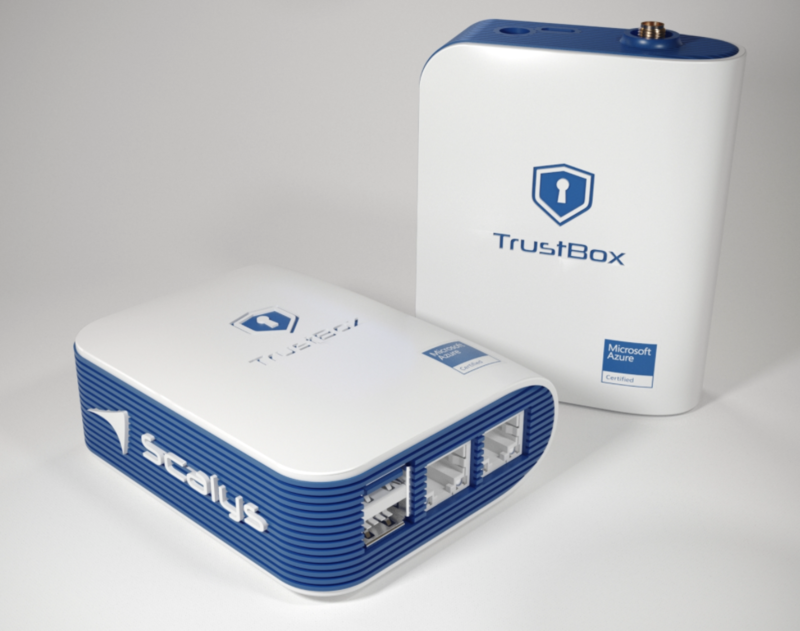 The Scalys TrustBox is expected to be shipped from March 2019.